Two nursing homes in a seaside town have been placed in special measures after being rated inadequate by a health watchdog. 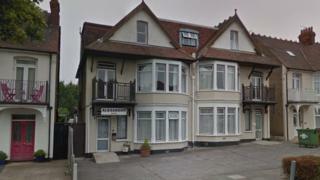 Inspectors said Ravensmere Rest Home and Alexander House Private Nursing Home in Westcliff-on-Sea were providing "inadequate care" and not "well-led". The Care Quality Commission (CQC) said residents were "at risk of harm" because of ineffective fire measures. Health and Home (Essex), which runs the homes, is appealing the CQC's decision. Reports into both homes said "fire safety procedures and control systems were not effective", with fire doors at Alexander House "poorly maintained". It said medicines were "not stored safely" at either home. Image caption At Ravensmere inspectors found that "staff members did not feel supported by the management team"
At Ravensmere, inspectors saw a member of staff "walk away from the medicine trolley without locking it" and "on another occasion we saw the same staff member had left the keys to the medicine trolley in the lock". They said baths there had "worn enamel exposing the surface beneath which prevented effective cleaning". At Alexander House, the report said "staff members did not feel supported by the management team". Andreas Stavrinides, a director of Health and Home (Essex) Ltd, said: "We are appealing against the decision [to place the homes in special measures]. "We believe that the evidence they rely on is misplaced and disproportionate. We accept there were shortfalls but not to the extent described." He said the firm had made a number of changes to meet concerns which were not reflected in the CQC reports. "We have made a number of representations to the CQC," said Mr Stavrinides. The homes have been told to make improvements within six months.